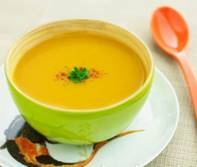 If you are starting a 21-day purification program during the winter season, it is really helpful to make a big pot of soup. Especially soups that contain plenty of vegetables and a protein such as chicken, fish or lentils work really well. They are not only healthy but easy to make. You can store them in your refrigerator and reheat a cup or a bowl whenever you feel hungry. Here are some recipes for you to try. I hope you enjoy them as much as we do. § Heat the oil in a 10 qt soup pot and add the onion, carrots, celery. Stir in the leeks. Add garlic, bay leaves, thyme. Add the tomatoes. Simmer for 10 min on medium heat, stir well. § In the mean time, get the water boiling. Add the boiling water to the soft vegetables and let boil for three minutes for the oil and water to combine. Stir in the bouillon. Add pepper and salt, pinch of cayenne. § In the mean time, rinse the fish and cut into small 1.5 -2 inch chunks. Drop the fish on top of the soup. Add the firmest fish first, 5 minutes later the smaller pieces. Cover and boil on medium heat for about 12-15 minutes. § Stir and add pepper and salt to taste, stir in saffron. § In a large soup pot, heat oil and add onion, carrots and celery on medium heat, stir well until soft. Add the garlic, oregano, basil, bay leaf and cook for 2 minutes. Add tomatoes and water and bring to boil. Let simmer for at least an hour on low heat. When ready to serve, add spinach and pepper and salt to taste. · 1/3 butternut squash, peeled, seeds removed, cut into 1-1.5 inch chunks, freeze the rest in zip lock bags for the next 2 soups. § Melt butter in a large soup pot, and add onion, carrot, red bell pepper, and leaks last. Stir well and cook until soft, not brown. Add garlic and stir. Add butternut squash and stir well. Close the lid and let simmer on low heat until squash is soft. Once soft, add the water and bring to a boil. Stir in the bouillon. Switch off and puree with hand blender. Warm up again and add pepper and salt to taste. If too thick, add more water. Serve with a drizzle of whipping cream.